Brandon Routh stars in his latest action movie in “Lost In The Pacific,” China’s first ever feature film in English which also stars Zhang Yuqi, Russell Wong, Bernice Liu. Directed by acclaimed filmmaker Vincent Zhou, “Lost In The Pacific” finds Routh playing on the role of a mysterious chef aboard a luxury airline on its maiden journey. “Lost In The Pacific” is set in the near future 2020 when the inaugural flight of a grand commercial aircraft, filled with elite passengers, is forced to make an emergency landing on a strange island after encountering a terrible storm while traversing the Pacific Ocean. Routh plays a high profile yet mysterious chef with military background who soon realizes that some people on the island might be “hijacking the plane”. "With complex character relationships, dark, mysterious creatures all in groundbreaking 3D with top-of-the-line visual effects and a celebrated team both in front of and behind the camera, the film has all the makings of a worldwide box office hit," said of the movie’s executive producer Ying Ye. Since this is China’s first movie filmed using the English language, one of the cast members, China-based actor Dai Xiang Yu, who has appeared in the popular 16-episode Web series “White Campus Belle” and “Long Legs 2” in China, had faced challenges adapting to the language. 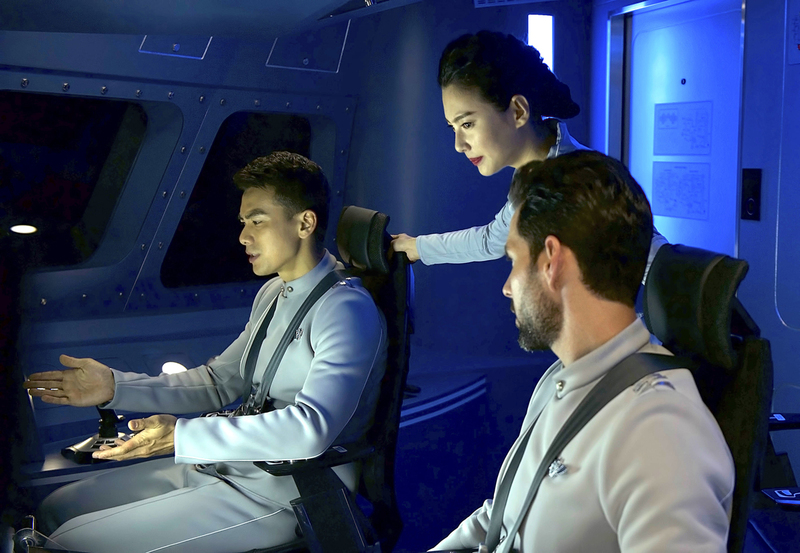 Dai, who plays the assistant pilot of the giant luxurious plane in the movie, had to seek help from an English teacher in understanding the script. "I hired an English teacher to help me and even memorised the script in the 15 days leading up to the shoot. I could probably have recited the script backwards! But it didn't help much. They would sometimes change the script on the spot. My lines also contained a lot of technical terms because I play an assistant pilot. Once, I was saying my lines when a US assistant director told me: 'I don't understand what you are saying!'" said Dai, adding that things were so tough, he became reluctant to go to the set each day. "I was under pressure every day so I walked really slowly to the set,” shared Dai in recent interviews. Director Zhou promised an adventure of "monumental proportions to audiences all over the world that will keep them on the edge of their seats until the very end, and even after they leave the theater." “Lost in the Pacific” opens February 10 in cinemas from Pioneer Films.